Assessment is a hot topics in student affairs, but in most places, there may be more talk than action. I think this comes from two problems with the process: Runners Don’t Take Photos and the Dusty Binder Syndrome. Runners Don’t Take Photos is simple. The woman running the race isn’t the one stopping to document the moment. She’s got something else on her mind. Most people who get into student affairs don’t pick the field because they love filling out reports. They’re likely relators or doers who are busy working in their area of expertise. Stopping to zoom out, plan ahead, and measure is a luxury most people don’t think they have. The Dusty Binder Syndrome is caused by that feeling you get when you spend time on a project you suspect will just gather dust on a shelf. When we fill out forms because of a process rather than a need, it demotivates and fails to create change. Are we assessing for accreditation or assessing so we can get better at what we do? Hopefully both, but how we set up the process matters. You can use improvement-focused data in accreditation reports. But data gathered for accreditation won’t always lead to real change. In fact, gathering info on the same things we’ve always done may insure a lack of change. Too many startup business plans look more like they are planning to launch a rocket ship than drive a car. They prescribe the steps to take and the results to expect in excruciating detail, and as in planning to launch a rocket, they are set up in such a way that even tiny errors in assumptions can lead to catastrophic outcomes. The customers failed to materialize, the company had committed itself so completely that they could not adapt in time. They had “achieved failure” – successfully, faithfully, and rigorously executing a plan that turned out to have been utterly flawed. Instead of making complex plans that are based on a lot of assumptions, you can make constant adjustments with a steering wheel called the Build-Measure-Learn feedback loop. Through this process of steering, we can learn when and if it’s time to make a sharp turn called a pivot or whether we should persevere along our current path. The strategy may have to change (called a pivot). However, the overarching vision rarely changes. Entrepreneurs are committed to seeing the startup through to that destination. Every setback is an opportunity for learning how to get where they want to go. Too many higher ed assessment plans make the same mistake. It makes sense. The academic mindset is more likely to tolerate forms, processes, and change that takes time. (After all, a dissertation isn’t written in a day) But that mindset is a core reason we’re struggling to innovate or change. Most assessment processes are too specific and rigid. It’s the rocket ship instead of the car from above. This leads to people who spend their days filling out forms instead of leading, creating value, or connecting with students. As student affairs begins to value assessment, we need to consider how we assess what we’re doing. We need to build a process that encourages innovation. 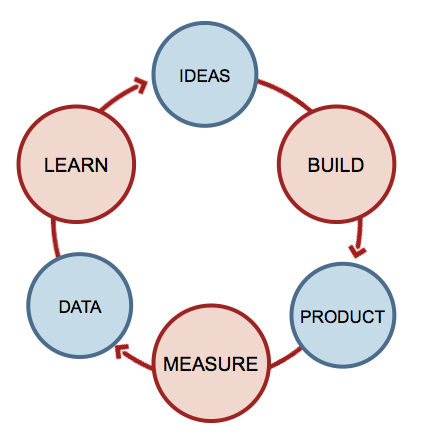 The Lean Startup’s Build-Measure-Learn process is a good starting point. Have a vision. Create it. Test it. Adapt. The 20-year plan is gone. The 5-year plan doesn’t work, either. So know the “what” of your organization: Have big vision and values, and know what your department or organization stands for. But the how has to be flexible. So assessing the “learning outcomes” may need to change from year to year, too. “The only way to win is to learn faster than anyone else.” Seems like an appropriate mindset for an educational institution, right?